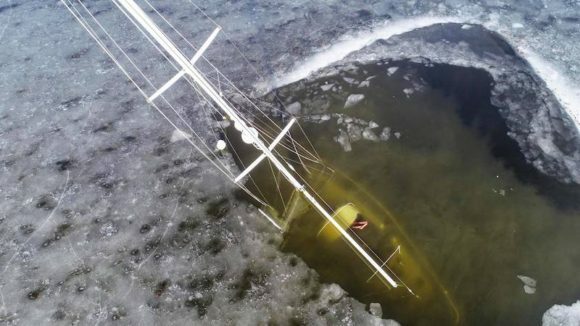 Frank Dinardi of East Haddam has become an overnight social media sensation with an extraordinary video that he captured of a boat initially at its mooring in Hamburg Cove,Lyme, and then subsequently after it had sunk last week. His video has now been viewed over 150,000 times and he also has taken numerous photos that are posted on his Facebook page of various stages of the whole sad episode. Great effort by the volunteer Lyme Fire Department for 8 hours of their time on a Saturday to raise the boat in dangerous conditions to protect the Cove. Thank you guys! Great job Lyme volunteer Fire Department for 8 hours of work Saturday successfully pumping out the sailboat, only to see it go to the bottom the next day. Trying to save that boat in the cove to avoid any pollution spill was exemplary. You guys were awesome.